The 'difference' of the 'party with a difference' now threatens to spoil its party. Ever since Narendra Modi and Amit Shah took the reins of the Bharatiya Janata Party, it has been on a roll electorally. In several states even electoral failure couldn't stop it from assuming power. But its desperation for an encore, in Karnataka, has boomeranged. After Governor Vajubhai Vala appointed BS Yeddyurappa chief minister despite the BJP not having a majority in the legislative assembly, a large section of the political spectrum cried foul. So intense was the bitterness that demands were raised to follow the same principle and bring down BJP governments in Goa, Bihar and Manipur. After a night-long drama, when the Supreme Court did not stay the morning swearing-in, the anger was palpable in Opposition parties. If the BJP could get a chance for being the single-largest party (SLP) in Karnataka, the Congress should also get the same chance in Goa and Manipur, the Grand Old Party claimed. Tejaswi Yadav demanded the same for Rashtriya Janata Dal in Bihar. Their claims found considerable support from other parties. On the other hand, not even its allies came out vocally in support of the BJP. The BJP had drawn considerable flak March last year after it scooped away Goa and Manipur despite the Congress being the SLP. In Goa, Governor Mridula Sinha accepted the BJP's claim that it enjoyed majority support though it managed to win only 13 of the 40 Assembly seats, and invited it to form the government. The Congress, on the other hand, was at 17 – closer to the majority mark of 21. The then Defence Minister Manohar Parrikar flew back to his native state to become CM with the support of the Maharashtravadi Gomantak Party, the Goa Forward Party, the Nationalist Congress Party and Independent members. 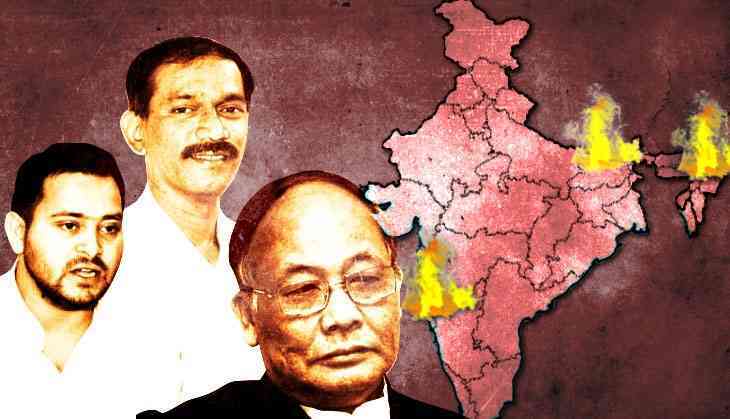 Manipur followed the same pattern: The Congress was not invited despite having 28 members – three short of majority. And the BJP, with 21 MLAs, cobbled an alliance with the Naga People's Front, the National People's Party (NPP), the Lok Janshakti Party and a renegade Trinamool Congress MLA. Aspersions were cast that the BJP could pull these off thanks to faithful governors and rampant horse-trading. A few months later, last July, Bihar Chief Minister Nitish Kumar put in his papers citing differences with ally Rashtriya Janata Dal (RJD). The BJP swooped right in with its 53 MLAs to back the 71 of his Janata Dal (United). Again, the SLP – in this case RJD with 80 MLAs – didn't get a chance. Earlier this year, the Congress again missed the bus in Meghalaya bus. In this case, however, it was tied with the NPP with 20 seats each in the 60-member House. But the later got support from the BJP and others to form the government. These inctances came back to haunt the BJP Thursday when the Congress and the RJD raised demanded that either the principle of Karnataka should now be levied in such states or the Congress-JD(S) alliance be given a chance to prove its majority there. Goa Pradesh Congress President Girish Chodankar sought time from the Governor to lay claim over the government there. He later tweeted that the party has got a Friday noon appointment with her. Manipur Congress leader and former CM Okram Ibobi Singh said he too would meet Governor Najma Heptulla for Friday. Bihar Opposition Leader and former deputy CM Tejashwi Yadav also talked about meeting Governor SP Malik. He also called for Opposition leaders from across the country to go and campaign in Karnataka capital Bengaluru. "Yesterday it was Bihar. Today it is Karnataka. Tomorrow it can be any other state. This dictatorship will continue. I earnestly appeal to all opposition parties to get united to save constitution and democracy"
We are not only single largest party but single largest block of pre poll alliance in Bihar. Then why should we not be called to form government in Bihar? Tomorrow at 1 PM will meet Bihar Governor. I will meet Honourable Governor of Bihar along with MLAs as we are single largest party of Bihar. Once more an occupant of a Raj Bhavan allows himself to be used as a rubber stamp. BJP announces (& then deletes) the details of #Yeddyurappa swearing in slated for tomorrow before it can be officially communicated. On the other hand, the few major allies that the BJP are left with – the People's Democratic Party, the Shiromani Akali Dal and the Lok Janshakti Party – did not come out in any major way to back the saffron party. Realistically perhaps the Congress and the RJD do not stand much of a chance even if they get appointments with the state governors: An elected governmet can only be brought down on the floor of the House. But the grandstanding in the three states managed to generate a lot of political buzz which will only add to the BJP's pressure over the ongoing Karnataka imbroglio. Trinamool sweeps Bengal Panchayat polls. But has violence made it a pyrrhic victory? READ NEXT >> Trinamool sweeps Bengal Panchayat polls. But has violence made it a pyrrhic victory?